Putting the pumpkin back in pumpkin spice. I got riled up the other morning. This does not happen often. I am typically pretty happy-go-lucky, but Facebook took me over the edge. It wasn’t a political statement, first-world problems or one of the uglier -isms, no it was pumpkin spice. In a world where we increasingly vilify real food in favor of weird, processed and extracted things like the powders, bars and Big Macs that are slowly killing us, I hit my wall at this autumn’s onslaught of pumpkin spice. The aforementioned lattes, scones and pancakes are delicious, I’m sure, but they owe their flavor to pumpkin as much as a green Jolly Rancher gains its tart/sweet bite from apple juice. Rather than stew, I stood up and entered the kitchen, pulling a container of freshly roasted Galeux d’Eysines pumpkin out of the fridge. I combined it with oatmeal and baking spices, two tablespoons of maple sugar and a pinch of salt. And…? Success! Pumpkin spice that tasted like pumpkin. A breakfast with enough fibre to make every dietary organization in America faint with delight. Most importantly, it was hearty and delicious, the perfect start to a crisp fall or brisk winter day. You could even enjoy it with a latte. Fresh pumpkin makes his extra special. 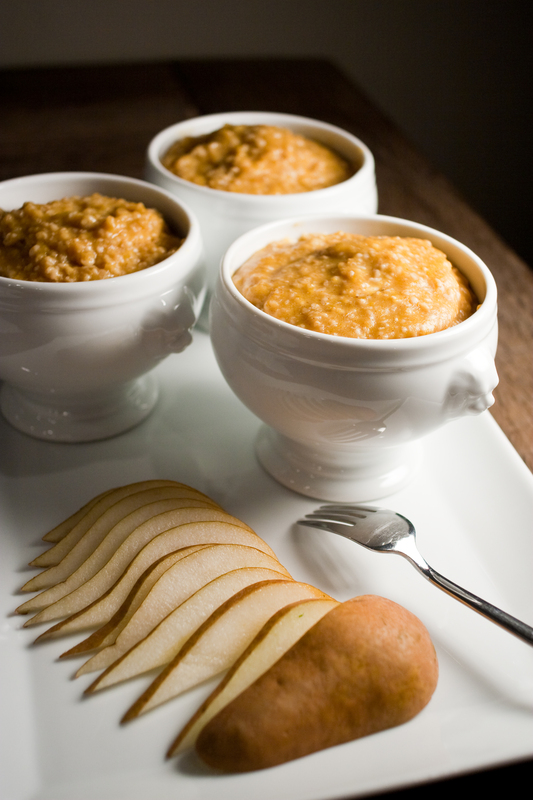 Roast a peanut pumpkin, Speckled Hound, Long Island Cheese or Hubbard. Or open up a can. Just make sure there’s real pumpkin. Mix together all ingredients in a small saucepan. Cook over medium heat, stirring as oatmeal thickens. Cook to desired thickness, remove from heat and serve. God did just fine creating cauliflower. Pure, creamy and white, it needs nothing more than a quick steam before tossing with salt, pepper and farm-fresh butter. That, however, is not the shortest path to impressing you with my culinary creativity. So, last week in the test kitchen we were faced with a decision: sweet and Indian or hearty and French? We stayed up until 1 AM and tried both. Here’s effort number one. Cauliflower provides the comforting weight of potatoes with a mouth feel as light as zucchini or yellow wax beans. We found earthiness and luxury in Crimini mushrooms, sliced and sautéed, finished with thyme and white wine. 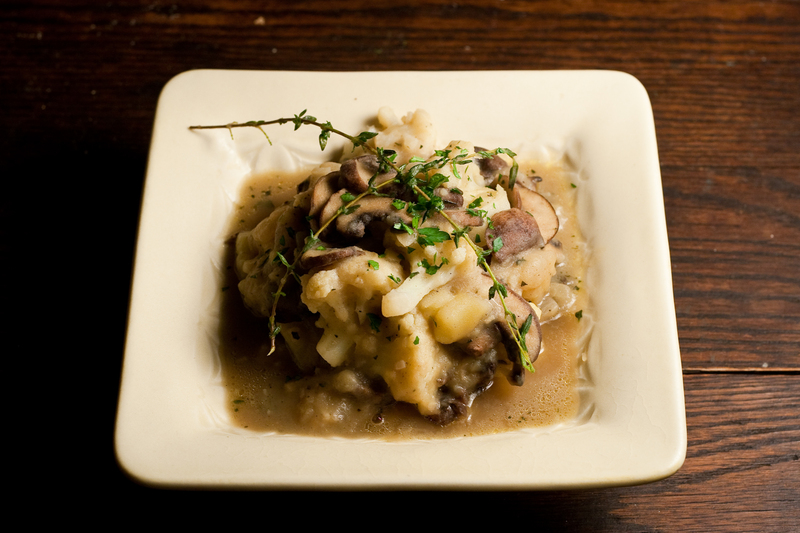 Yukon Gold potatoes, relatively low in starch, gave heft without weighing our stew down. We needed depth, and found it in garlic and anchovy paste. 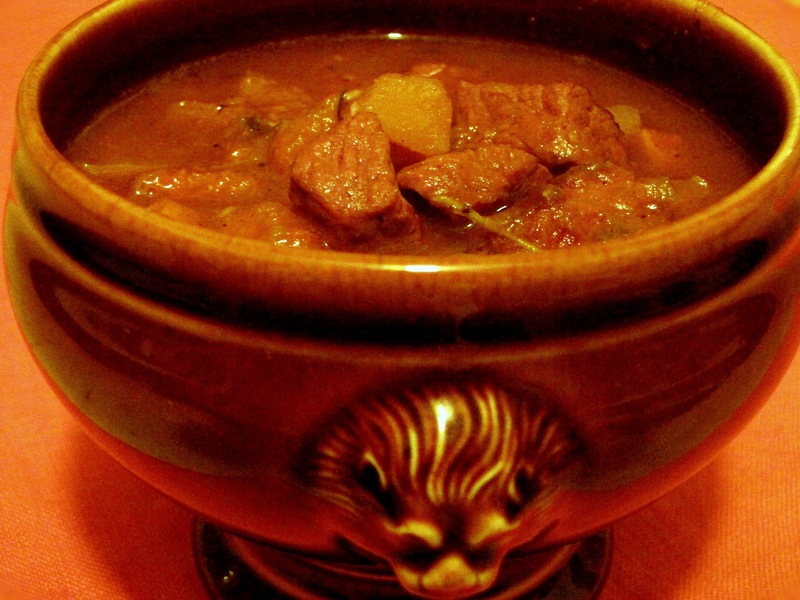 A spicy, robust olive oil finished the stew richly. We had achieved cauliflower stew Nirvana: hearty enough for a cold, damp fall night, but light enough that we weren’t crawling to bed from the dinner table. You’re freaked about the anchovy paste, aren’t you? Your nose is wrinkled in disgust at the thought of that fishy, salty brown paste, oozing like toothpaste from a tube. Anchovy paste adds necessary layers of flavor in a dish that might otherwise feel one-dimensional. You won’t taste it. It’s one of those perfect stealth ingredients, delivering lots of flavor without getting caught. So go ahead, squeeze a little in, and don’t tell your kids or your picky eater of a boyfriend. They’ll never know. **Sapore’s latest introduction, Moresca is a bold, spicy oil perfect for dipping bread, tossing with pasta, arugula and walnuts and gave great depth as a finish to this stew. Melt butter over medium heat in large sauté pan. Sauté mushrooms until golden brown on edges. Deglaze with Vermouth. Season with thyme, salt and pepper. Reserve. Heat olive oil in same pan. Sauté onions until translucent, add garlic and anchovy paste and cook 30 seconds. Add potatoes and cook until onion begins to brown on edges. Stir in the stock, cover and cook until potatoes have started to soften. Add cauliflower and fresh thyme. Cover and cook until cauliflower is crisp tender. Uncover and let broth thicken. Season to taste with Moresca oil, salt, pepper and nutmeg. When I came across the inspiration for this stew, I was excited, but it disappointed. The squash was flat and grassy. The beef? Barely there. Roasting the squash and a homemade beef stock would solve the problem. While well worth the effort, I’m sure, the average weeknight doesn’t afford me the twelve hours a good beef stock takes. How to speed this up? Carrots added with the squash brought out butternut’s sweetness and a splash of cider vinegar brightened it up. Brandy, and miso gave the beef flavor depth, while butter – good, rich, creamy, grassy, Amish butter – gave the soup the richness it needed. Heat a 6-8 qt heavy-bottomed stock pot or dutch oven over med-high heat. Add oil and heat until smoking. Cook beef in batches, seasoning lightly with salt and pepper. Sear until brown. Remove beef to a bowl and reserve. The beef juices will brown on the bottom of your pot. Don’t worry, this is pure flavor! Add 1 cup stock and deglaze pot, scraping up the rich brown bits off the bottom of the pot. Add squash, carrot, thyme, bay, reserved beef and remaining stock. Simmer until squash is soft. 30-45 minutes. Remove half the squash and carrot, and mash or run through a food mill. Return the mashed squash to the pot. Season to taste with a splash of vinegar and brandy, butter, miso paste, salt and pepper. Cook 5 minutes to thicken.